Enviar solicitação de disponibilidade com as datas desejadas para Alila Jabal Akhdar. Experience this glorious destination from the comfort of the 52 sqm Mountain View Suites, housed on the upper level of the main hotel building. Designed to inspire relaxation, the suites include features such as luxury bed linen and a balcony offering stunning panoramic views. Experience this glorious destination from the comfort of the 52 sqm Mountain View Suites, housed on the upper level of the main hotel building. Designed to inspire relaxation, the suites include features such as 1 King-size bed, luxury bed linen and a balcony offering stunning panoramic views. 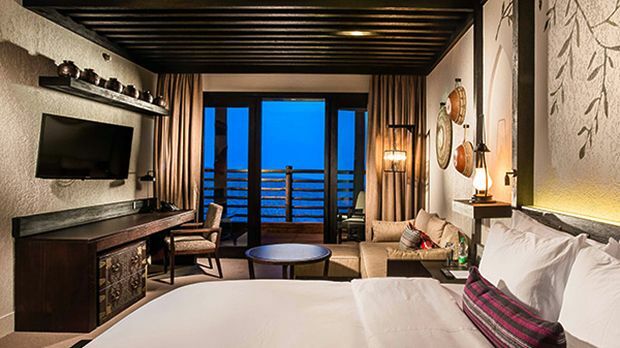 Located at ground level, the Horizon View Suites offer ease of access to the resort facilities and awe-inspiring vistas of Jabal Akhdar’s majestic peaks. Enjoy the contemporary comforts of these beautiful mountain retreats, which include a freestanding bathtub, separate rain shower, Wi-Fi Internet and flatscreen TV. Delight in the careful attention to detail in all the amenities and an outdoor terrace with spacious seating area where you can relax as you plan the next day’s travel adventures. Located on the first floor, the Ridge View Suites offer a haven of blissful tranquility, immersing you in superior comfort and beautiful furnishings that ensure a relaxing stay. Contemporary design and stylish décor graced with local accents meet with modern, hi-tech amenities and signature luxuries such as a freestanding marble bathtub and separate rain shower. Step out onto the large private balcony where the rugged beauty of the landscape and views down into the gorge make for stunning pictures and unforgettable memories. For those wishing to immerse themselves in the wonder of the great outdoors, the Jabal Terrace suites located on the first floor are a perfect choice. Each suite features a spacious indoor living area furnished in contemporary style with touches of local inspiration and a host of creature comforts. The suite opens onto an equally large outdoor terrace where you can fully appreciate the majesty and mystery of this incredible destination, and connect with nature under the vast night sky, enjoying sunsets and stargazing. Housed in the main hotel building, in close proximity to the resort facilities, the Loft Suites offer of open-plan space spread over two storeys, with spacious living area and bathroom facilities including a shower downstairs, and bedroom with en suite bathroom upstairs. Enjoy a truly relaxing stay in this haven far from the bustle of modern life, complete with every comfort and convenience, framed by mountain views from your loft bedroom. An ideal suite for families. Sprawled over 361 sqm, the resort’s two exclusive Jabal Villas combine an indulgence of indoor and outdoor space with the most amazing views you can imagine. While appreciating the privacy that surrounds each villa, revel in the sense of openness throughout the villas’ two bedrooms with en suite bathrooms, large living room, dining room, kitchenette, private terrace and pool. Discover new depths of relaxation in the master bathroom, housing a steam room, shower, oversized bathtub and attached Jacuzzi. Beautifully furnished throughout for a stylish at-home feel, these luxurious villas offer all the pleasures of the ultimate mountain retreat. Ideal for travelling with friends or family.